Providing feedback to colleagues can be risky business. I was reminded of this as a client recently shared a situation that arose in her office. After ongoing complaints from her team that the office kitchen was regularly disorganised she decided to create a kitchen roster. The roster would require all staff to participate in kitchen duty for five days per year. The duties were not onerous, mostly unloading a dishwasher and putting fruit in a bowl. She sent an email to all staff detailing this proposition, stating that everyone would be expected to participate regardless of seniority. All responses were positive, except for one. 3. Senior staff shouldn't be wasting their time with kitchen duties. Following this email there were several conversations between Anne and John. Anne believed that John's cultural background, particularly in relation to gender and hierarchy, were key factors for his lack of cooperation. Her concerns also extended to the message that would be sent to the team if she excluded John's name from the list. One of Anne's colleagues quietly mentioned to her that John's behavior and attitude to both this and a couple of other situations had confirmed his suspicions, that John was not 'a team player.' This colleague had been contemplating increasing John's responsibilities but had now decided that John wouldn't be an appropriate candidate for the expanded role. Upon reflection of this conversation, Anne believed that John deserved to be given some carefully considered feedback and an opportunity to consider the wider impact that his actions were, and could potentially, have on the team and his career. Anne organised a meeting with John. She began by asking him some open-ended questions, beginning with "what message do you think will be sent to the rest of the team if you are removed from the list?" This provided an opening to begin the discussion about the wider impacts that often seemingly small and insignificant issues can have in the broader context. Although John still didn't agree that he should be on the list, he did eventually understand the impacts that could occur if he wasn't seen as participating, so he agreed to be involved. I tell this story because it serves as a great example of CQ and EQ. It takes cultural awareness, perspective and empathy; combined with a healthy degree of courage. We don't always agree with the behaviours and attitudes of others, but it is important to consider their perspectives and the broader effects. 1. How comfortable am I when I provide feedback? 2. Am I able to provide feedback in different cultural contexts e.g. indirect and indirect styles, high context and low context cultures etc.? 3. How well do I listen when I receive feedback? Emerging Markets - There are so many developing economies and markets - Tom examines some of the key things to keep in mind when entering an emerging market. 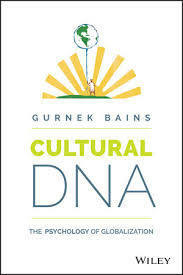 Cultural DNA was one of the best reads that I have had in a while. This book has some profound insights and discussions. The premise of Cultural DNA is that each culture has attributes that have developed over thousands of years and have adapted (and continue to adapt) to their unique environments. These characteristics form the basis of our cultural DNA and continue to reverberate throughout our societies today, affecting everything, from our economic institutions to consumer psychology and organisational culture. Every company's strengths, development requirements and culture are rooted in their country of origin. There are always certain similarities and differences and tuning into either of them is a judgement call that leaders regularly need to make. Bains claims that leaders need to understand the psychology and history of the cultures that they are leading and working within if they want to make long-term strategic decisions. Bains bases his claims on an analysis of 1700 in-depth reports with executives from across the globe, interdisciplinary research and case studies. He identifies core DNA themes for each culture and examines the history and psychology of eight key global countries to demonstrate that our ancient ancestors may have greater influence over us than we think. I am looking forward to facilitating a half-day workshop 'How does culture influence your story' at The Story Conference to be held in Melbourne on 23rd November. There are still tickets available. For the month of June there are Super Early Bird registrations by using the code DrTomV50. For further information click here. If you would like to hear a short interview of Tom discuss what to expect at the workshop click here.